By grrlscientist on July 11, 2010. Image: Dan Logen, 14 January 2010 [larger view]. Nikon D300, 600 mm VR lens. ISO 500 1/400 sec, f/6.3. The dark eye rules out last week's genus. The light eye ring and lores, rather short bill and uniform coloring suggest to me Plath's less interesting poems. I think this one has beaten me. There are birds with white throats, white eyerings, brownish ear coverts and black tails. I just cannot find or think of one with all these. The bill suggests either a Greenbul, Chat or Flycatcher. I can't solve Carel's clue either. Help. Clue: it is a female. The post @4 by "evden eve nakliyat" is some fecking Turkish spam. Sorry Dan, still lost. I guessed it was a female but have you tried to find pictures of them? Yours must be the only pic of a African female bird in existence. The nearest I can get is Pale-breasted Illadopsis, but I guess that's way out. Have looked up Sylvia Plath but still can't get the clue, Carel. I'm not much into poetry or literature, but reading about Sylvia Plath has been fascinating. I found several of her poem titles which suggest birds, and decided that was not the way in which Carel was meaning, as none of them suggest this bird. Some of her titles: "Goatsucker", "Owl" "Pheasant" "Go get the goodly Squab" "The Shrike"
Another clue: The name of this bird contains the name of a mid-Eastern country. Got it, the country would be a repressive Islamic one, thanks for the clue Dan. I've only seen the more colourful male. A frontal shot of this bird would have given it away immediately. I said it might be a Chat. 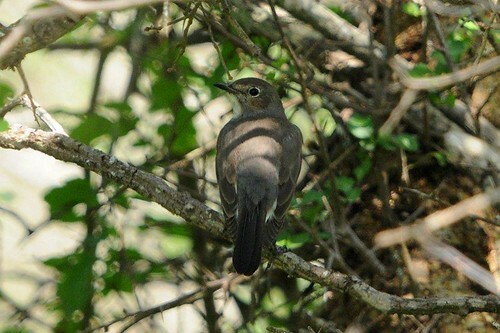 On the wrong track, I guessed it was a Garden Warbler - Sylvia borin. I had followed the Sylvia part of the clue, Carel, and borin' would describe Garden perfectly, clever that. AS Grrl hasn't updated yet, can I name it as White-throated Robin? or Irania, (Irania gutteralis). A big thanks to Dan for the clues, I missed this one completely.